This Award will recognize an early phase research project that met or surpassed its objectives on a range of key performance indicators. The entrant should show that the successful completion of the program was material in enabling the sponsor to advance its drug to the next development phase either on or ahead of schedule and/or keeping within its development budget. To be eligible, drug development activities must have taken place during 2017. Entrants must have played a role in the early phase research, and all joint parties must be disclosed in the application. Full details of the project; i.e. project name (i.e. name of drug candidate or trial title), phase of development, target indication and population studied (if applicable), sponsor(s), and the primary drug(s) tested. Summarize the major findings of the study, such as in vitro/in vivo results or primary/co-primary and main secondary endpoints. What were the main milestones and deadlines for the preclinical or Phase I study? Please supply evidence of how these were met or surpassed. How did this study enable advancement of the drug to the next development stage? The attempt to combat rare diseases is a challenging task that exemplifies how the pharmaceutical industry addresses unmet medical needs. This Award will recognize the efforts of an individual, team, or company that demonstrated excellence while developing a drug seeking to treat rare diseases. The judges will be looking for a drug development program or trial with the largest potential impact in the rare disease space. Outstanding patient centric processes and innovation in study conduct to overcome the various obstacles of rare disease drug development will also be rewarded. To be eligible, drug development activities must have taken place during 2017. Entrants must have played a role in drug development and/or trial conduct, and all joint parties must be disclosed in the application. Details of the drug development program or clinical trial; i.e. rare disease(s) being targeted, name of drug(s), trial name(s) (title, protocol ID, trial identifier), phase, patient segment(s) studied, and sponsor(s). Provide evidence of the impact that the drug has had, or potentially could have, on the patient population and addressing unmet medical needs. Describe any unique strategies used to ensure successful clinical research conduct within this challenging space, such as patient centric processes (i.e. close engagement of patient advocacy groups), innovative patient recruitment methods in identifying potential trial participants within sparse patient populations, or study planning strategies (i.e. use of surrogate markers or original tools and approaches to gather key clinical data). The voice of the patient has grown louder in clinical research, driving sponsors and drug development teams to turn a focused lens on the consumer. To better understand the perspective of the patient, fundamentals of consumer and behavioral science are being applied throughout the clinical trial lifespan -- well in advance of a drug reaching the market. This Award will recognize the efforts of an individual, team, or company in bringing the voice of the patient-consumer into the clinical trial arena. The judges will be looking for creative and collaborative initiatives that engaged the patient community and translated its expressed needs, values and desires into action. To be eligible, drug development activities must have taken place during 2017. Entrants must have played a role in the design or implementation of the study protocol/drug development program, and all joint parties must be disclosed in the application. Details of the clinical trial or drug development program; i.e. disease(s) being targeted, name of drug(s), trial name(s) (title, protocol ID, trial identifier), phase, patient segment(s) studied, and sponsor(s). Evidence of the impact the patient-centric activity had on the trial/drug development program; if available, please provide documentation (URL) in support of the achievements described. This Award will recognize the clinical research team who have made significant contributions in advancing a new therapy through one or more clinical phases. 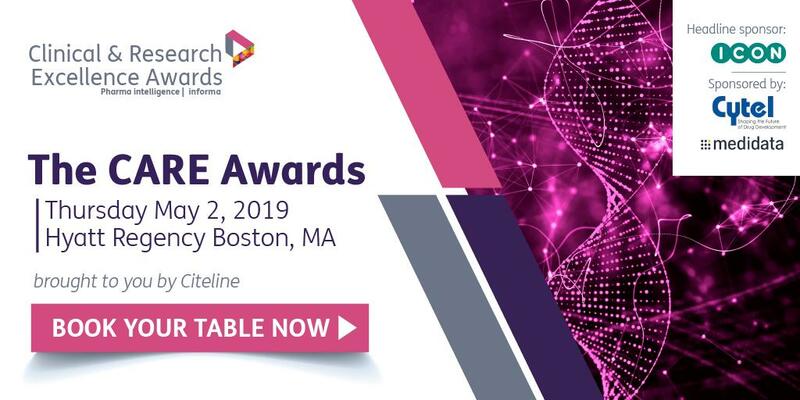 The judges will be looking to reward the high performing team that has been most successful in reaching its goals, adopted effective working practices, achieved major milestones within expected timelines, and contributed to the advancement of new therapies. The company’s name, the team being entered and basic details of its core project, ongoing or completed in 2017. What was the greatest achievement of the team during the qualifying period? How did all members/functions of the team work together to achieve its goals? How does the achievement contribute to advancing new therapies to market? What work practices has the team adopted to support the success of the product’s development? If you believe that this team is particularly outstanding, but for reasons not covered in the questions above, please give relevant details. This Award will recognize innovation in clinical trial design. This might include trial aspects such as original patient segmentation, collaboration with a non-traditional partner (i.e. regulator, technology company, etc. ), use of novel biomarkers or technology, and/or inventive methods to improve or monitor compliance. Full details of the study; i.e. trial name (title, protocol ID, trial identifier), phase, disease type and patient segment(s) studied, sponsor(s), and the primary drug(s) tested. Summarize the clinical trial design aspect that demonstrated innovation and its significance. If available, please provide documentation (URL) in support of the innovative trial design; i.e. registry posting, press release, investor presentation or other publication. This Award will recognize the clinical trial that has had the greatest impact in 2017, and is expected to lead to an advance in healthcare. The judges will be looking to reward the clinical trial with the largest commercial impact, highest impact on patient population, the greatest disruption in a market, or the advancement of clinical trial design. This might include the first demonstration of a clear clinical effect for a new drug in an area of unmet medical need, a pivotal study of a new drug with a breakthrough mechanism of action, or a major study of a potential new or expanded indication for an already marketed product. Documentation (URL) of publically available trial results required; i.e. press release, conference abstract/presentation, clinical study report synopsis or other publication. This Award recognizes the promising and disruptive role that digital health technology is currently playing in clinical trials. Technological innovators are discovering novel ways to gather high quality patient data using an array of digital tools. Advances in development of smartphone apps, mobile health devices, and a host of other products are revolutionizing the way patients participate in clinical trials. The judges will be looking for the product that represents the best advance in improving patient data collection and/or the patient experience in clinical trials. Those considered may include electronic patient diaries, mobile health devices or any other digital tools that support, encourage or aid the patient’s participation in the clinical trial. Companies wishing to enter must have played a role in the development of the nominated technology, and all parties to any joint development agreements should be disclosed in the application. The name of all companies involved in the product development, including an outline of their role(s). Specify the date and market of the technology’s first launch, if applicable. Outline the key features and benefits of the technology, and how they support the patient’s clinical trial journey. What problems does this product solve and what is novel about it? What is the single most significant benefit of the entrant’s technology to users? If possible, please provide a link to a product demo (product webpage, YouTube video, etc.). This Award recognizes the vital importance of using the most sophisticated platforms to catalyse and optimize data gathered during clinical trials. Advances in software and applications have a pivotal role to play at all stages of the trial process, assisting Sponsors in effective management of study logistics, monitoring, risk mitigation and timely data collection and analysis. The judges will be looking for the product or suite of products that help study teams better manage and oversee clinical trial activities. Outline the key features and benefits of the technology, and how they support the clinical trial process. Where benefits include cost or time savings, please provide supportive data. This Award will be presented to two or more organizations who have set a new benchmark in partnering through collaborative clinical trial activity that took place in 2017. Partnerships could take place between multiple pharmaceutical and/or biotech companies or between a pharmaceutical and/or biotech company and a contract research organization, research institute, non-profit, or cooperative group. Entrants must have played a role in the collaborative clinical trial activity, and all joint parties must be disclosed in the application. How has partnership achieved an outcome that would not have been possible if partnership had not been created?If available, please provide documentation (URL) in support of the achievements described. Increasingly, clinical research teams are playing an active and vital role in supporting commercialization and market access strategies. Beyond the benefit-risk assessment of drug safety and efficacy required by regulators, key stakeholders including payers, providers and patients need data to understand the value of a drug. Cost savings, enhanced patient compliance and quality of life are among the many measures considered in the cost-benefit equation. This Award will recognize the efforts of an individual, team, or company that demonstrated excellence in health economics and outcomes research (HEOR). Eligible research may occur as early as Phase I or at any point throughout the product lifecycle, and may include Phase IV observational studies or patient registries. The judges will be looking for research designed to deliver robust value-based data to support product launch, commercialization or reimbursement. To be eligible, drug development activities must have taken place during 2017. Entrants must have played a role in the design or implementation of the study, and all joint parties must be disclosed in the application. Details of the clinical trial or registry; i.e. disease(s) being targeted, name of drug(s), trial name(s) (title, protocol ID, trial identifier), phase (if applicable), patient segment(s) studied, and sponsor(s). Describe the study and key outcome(s) evaluated to demonstrate the value of the drug to key decision makers and constituencies.Evidence of the impact the research had (or is expected to have) on commercialization, reimbursement or in establishing evidence-based decisions by stakeholders. The winner of this Award will be an exceptional individual with a consistent history of service, above and beyond the call of duty, throughout their career. This prestigious international Award will go to someone who has had a distinguished career in R&D or clinical research. Nominees may be retired or semi-retired but will still be active in research in some capacity. For this special Award, candidates must be nominated by a third party. The nomination should outline in no more than 750 words what the nominee has accomplished during his or her career and say why they are worthy of this Award.